This photo became famous all across the world, not just in the US. You can find the story here. I wish for his family and friends all the best. There are many discussions as to what drives ex-combatants from the Iraq conflict to do such things. It does need to be studied closely, as anecdotally, to me it seems there is a higher degree of suicides and/or self inflicted deaths for such soldiers from this conflict more than others. Perhaps it is associated to "general order number 1" and the soldiers cannot decompress in the field. After times of heavy and or close fighting, a soldier needs to be able to decompress and talk things out, even if it is just with his buddies. In all previous conflicts there has been no ban on pets and alcohol, and in some arenas beer was basically issued to soldiers. Before you jump on a bandwagon saying how horrible I am for saying this - hear me out. Guys, especially in such situations are not likely to just talk things out on their own. After having their tongues loosened a bit with a couple of drinks, they are very likely to talk it out - telling their "war Stories" to their buddies. Many have pets they talk to (don't tell me you have never talked to your dog) I am probably wrong, but I believe research will prove me right. I do not mean so much to digress on this issue - but more so about honoring the soldier who fell probably due to the wat, but not in it. I actually didn't know that expression until I saw it here. Had to read the story you linked to in order to understand it. Damn shame that he wasn't getting the help he needed. You mean "huffing"? I guess as an old cop I am familiar with most of these things. About the help - I guess he just didn't get the right kind - I know some people tried to help him. Thanks for stopping in Mark. 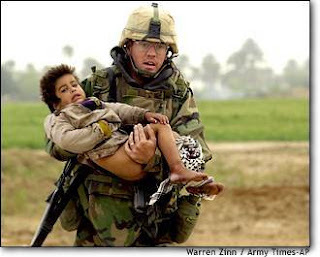 I think the trauma of seeing things people see in war would leave a person forever changed. I know that I could never be a soldier. I cry when I see a dead animal on the side of the road and to be around such violence and death would be incomprehensible to me. I really feel for him and his family. HNWBM: There are a lot of things people see in such situations. Sometimes I can get overwhelmed after investigating war crimes and mass graves, or going into war zones to train police.